Doris Ouellette of Auberge du Soleil (formerly of La Hêtriere) passed away on Thursday April 11, 2019 at the CHU Dr. Georges L. Dumont at the age of 92. Born on October 12, 1926 in Richibucto Village, she was the daughter of the late Alfred and Emilianne (Leger) Babineau. She was as member of the Memramcook Golden Age Club. 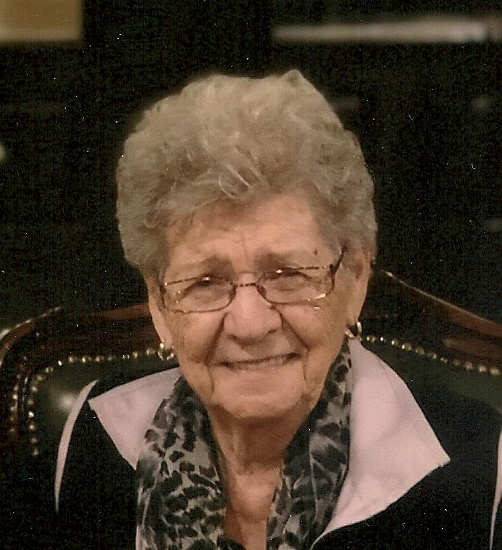 She will be sadly missed by her two daughters, Carmelle (Jean-Claude) Gionet of St-Joseph and Nicole LeBlanc (Gilles Goguen) of St-Marcel, three sons, Emery (Denise) Ouellet, Roger (Murielle) Ouellette and Bernard (Denise) Ouellette of La Hêtriere, nine grandchildren, 17 great grandchildren, one sister, Eva (Emile) Richard of Gardner, MA, two sister-in-law’s, Therese and Joanne and by several nieces and nephews. She was predeceased by her husband Aurele (1996), two sisters, Eva (infant) and Laurette and two brothers Arthur and Jean-Baptiste (Jack). Visitation will be held at Dupuis Funeral Home, Memramcook on Monday April 15 from 2 to 4 and 7 to 9 pm only. Funeral mass will be held at the Saint Thomas de Memramcook Roman Catholic Church on Tuesday April 16 at 11:00 am. Interment will be held in the parish cemetery.